The SCSI RDMA Protocol (SRP) is a network protocol that allows one computer system to access SCSI devices attached to another computer system via RDMA. SRP was designed to use RDMA networks efficiently. RDMA allows lower latencies and higher throughput than TCP/IP protocols, but requires network adapters with native RDMA support, e.g., HCAs for InfiniBand, RNICs on "lossless" (DCB) Ethernet, or TOE NICs with iWARP for standard Ethernet. SRP is based on the SCSI protocol, which is a point-to-point protocol with corresponding design limitations. In contrast, iSER is based on iSCSI, and thus better accommodates modern network requirements, including complex topologies, multipathing, target discovery, etc. Hence, iSER is most likely the best choice for InfiniBand networks going forward. SRP never became an official standard: the latest draft of the SRP protocol, revision 16a, dates from July 3, 2002. The InfiniBand/SRP fabric module (srpt.ko, Linux kernel driver database) for the LinuxIO was released with Linux kernel 3.3 on March 18, 2012 (2012-03-18). targetcli from Datera, Inc. is used to configure InfiniBand targets. 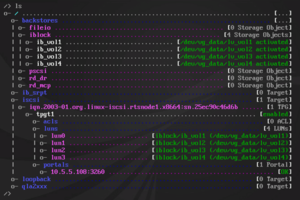 targetcli aggregates LIO service modules via a core library, and exports them through an API, to provide a unified single-node SAN configuration shell, independently of the underlying fabric(s). targetcli per default automatically assigns the default ID '0' to the LUN, and then changes the working context to the SAN storage object. The target is now created, and exports /dev/sdb as LUN 0. Taking you back to /ib_srpt/0x00000000000000000002c903000e8acd. Successfully created Node ACL for 0x00000000000000000002c903000e8be9. In particular, the InfiniBand spec file /var/target/fabric/ib_srpt.spec is included via RTSlib. WWN values are extracted via /sys/class/infiniband/*/ports/*/gids/0 in wwn_from_files_filter below, and are presented in the targetcli WWN context to register individual InfiniBand port GUIDs. # The ib_srpt fabric module uses the default feature set. wwn_from_files_filter = "sed -e s/fe80/0x0000/ -e 's/\://g'"
Note that while SRP TPGs are masked by targetcli, they are not masked by RTSlib. ↑ a b ANSI T10 SRPr16a, www.t10.org. ↑ Linus Torvalds (2012-03-18). "Linux 3.3". lkml.org. "SRP Update and Directions". openfabrics.org. 2012-05-27.